Spoiler Warning: Spoilers for Red Dead Redemption abound. Spoilers also ahead for Hotline Miami 2, Kingdom Hearts 2—and if those examples baffle you, trust me there's a point. Head home to see your family. That's the prompt you see after the death of Dutch van der Linde, the former leader of a Robin Hood-like gang that the hero of Red Dead Redemption, John Marston, was once a part of. It's the seeming end to the cowboy's quest, after being tasked with hunting down Linde (and other old comrades) for the Bureau of Investigation before he could be reunited with his family he was taken from at the start of the game. The prompt is a wave of relief, a feeling of thank God this is finally over. We're near the end. Marston's had a long journey. Maybe a little over 20 hours in real-world time, but weeks and even months for him. Marston's met a lot of folks across the American (and Mexican) Frontier; some old friends, some old enemies, some new faces altogether. Red Dead Redemption is often accented by musical moments, like rolling into Mexico while José González's soothing "Far Away" begins to play. Much later is the moment that cements Red Dead Redemption as something sometimes profound though: when John Marston rides home to his family after a long journey away, while the song "Compass" plays. And you're fully in control. 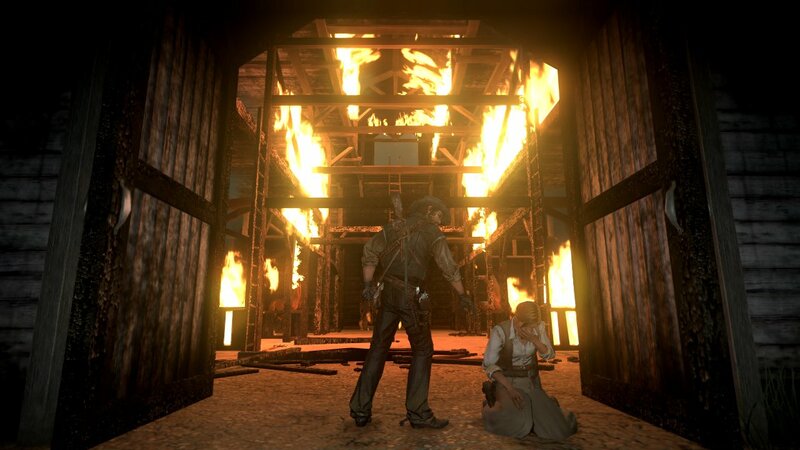 The entirety of the game up to this point, Marston's been something of a lone ranger. We know his wife Abigail and his son Jack are being held somewhere as he does the government's bidding under the threat of forfeiting his freedom, and further endangering his family; but we, the players, have never seen them with our own two eyes yet. He was never left with much of a choice in tracking down his old comrades and taking them down—he's only doing it because of the promise of returning to his family at the end of it. And the end takes quite some time to get to. It all culminates in a face off with his old gang leader Linde, who commits suicide by stumbling backwards off a cliff after a long stand-off. Linde's dead, the agents Marston's begrudgingly worked with as of late joke about his wife being dead before telling him that she and his son are safe and sound at his ranch. Shortly after, that's when "Compass" kicks in, a toned down version of a Jamie Lidell song by the game's composers Bill Elm and Woody Jackson. This version is a quieter folk song than the busier original, but it slowly kicks up in a similar way with reverberating strings, eventually crescendoing into triumphant horns as Lidell croons about making his way back to his loved one. In the context of Red Dead Redemption and this particular sequence, it fits like no other song. It's just Marston, his horse, and his family awaiting him at his little ranch. He doesn't need a compass, just his longing for his wife and son to guide him home. Red Dead Redemption's score is largely without lyrics, evoking the Wild West in 1911—a time where industrialization is on the up and up—largely through instruments and the occasional whistling. Marston's old criminal ways in this era are waning now that he's settled down with his family, at least until he's pulled back in against his will. 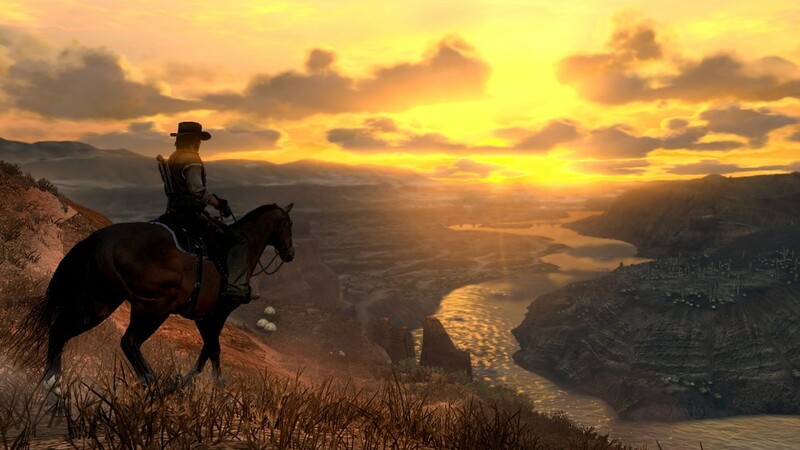 Even though Red Dead Redemption overstays its welcome in the third act where Marston's thrust into Mexico, it retains a level of character that still holds up today, even eight years after its debut on PlayStation 3 and Xbox 360. Video games, like all other visual-led media, have plenty of memorable music, whether you're into music-centric rhythm games or just love a particular boss theme from a SNES RPG. But rarely do video games have excellent musical moments: a point in time punctuated with music to make it unforgettable. There's not really an equivalent to what movies and television have. From Faye Wong bobbing her head to "California Dreamin'" in a food stall in Chungking Express, to an Imogen Heap-soundtracked shooting in the teen drama The O.C. that would later become a meme, music cues sometimes cement movies and television episodes forever in our minds. Above all else in Red Dead Redemption—yes above the quiet cover of "Bury Me Not On the Lone Prairie" over Marston's grave after his valiant stand-off with the government, above any emergent moment in the Wild West—Marston solemnly riding home after the most arduous journey of his life is what I remember most. There's no cutaway to him walking up to the gates of his ranch if the song ends before you arrive; nor a cutscene montage of traveling while the same song plays. You're just in the game again, prepared to make the long trek home with Marston, a trip that doesn't feel that long anymore now that his family is waiting at the end of it. And it's the unexpected needle drop where the song crawls in that makes it so memorable. It sweeps in to set a mood. Music with lyrics is something of a rarity in games beyond ending and opening credits. Quite often, it's relegated to licensed tracks for sports sims or open-world playgrounds, such as the Tony Hawk soundtracks of yesteryear that overflow with ska, punk, and hip-hop and the fictional radio stations with overly enthusiastic DJs that ad-lib between your otherwise relaxing race across Britain in Forza Horizon 4. Games, likely, steer away from music with singing or spoken word because the song will be repeated a lot, which can possibly get annoying. Some games, though, defiantly have their own lyricised music. Developers Supergiant Games is maybe the most prominent developer that does this, with Bastion, Transistor, and Pyre all having lots of sung music backing it. In fact, there's barely any original music without singing of some sort in it. The rares of all are the in-game music cues like Red Dead Redemption's. In Metal Gear Solid 3, there's the iconic wavering belt of "Snake Eater" as Snake climbs what seems to be the world's tallest ladder. It's an odd scene, but it makes what would otherwise be a very boring ladder climb thrilling. Then there's the romantic ballad of "Eyes on Me," a sort of theme for Final Fantasy VIII, that plays in the background while Rinoa and Squall talk aboard the Ragnarok. Like those games, Red Dead Redemption takes a more balanced approach to music with lyrics, peppering it only in where it's necessary, and never overloading it. Without the music cue, the penultimate sequence of going home wouldn't have the same impact. On that ride, we're saddled with the same complicated emotions as Marston; we're worried due to not knowing if Marston's family really is still okay, but happy on the chance that they're just fine. Of course, sometime after he returns home things take a turn for the worse, but this otherwise silent horse ride home is where Red Dead Redemption relishes in the quiet, contemplative nature of Marston's journey. The moments where he holsters his revolver and soaks in the world, even when we're just getting from point A to point B. The start of the end of Red Dead Redemption is about that feeling: the anxious return home to get some hugs and pats on the back. As Marston gallops through a forest, he watches the snow dissolve to show the dirt as he rides down the incline, making his way to the sparseness of where his plot of land lies far away. With the strings plucking away in the background, then the horns blasting with only the sound of your horse's trotting and occasional neigh, the sequence is sublime. Red Dead Redemption's "Compass" has stuck out in my mind ever since. When it comes on in a shuffled playlist or something, I always think back to that gallop towards home. I imagine in Red Dead Redemption 2, we can expect similar moments, or at least some twangy spaghetti western music fitting its decade-plus prequel setting of 1899. From what we've seen, Red Dead Redemption 2 is shaping up to hold a different tone from its predecessor, one less solemn, one less concerned with the downturn of the Wild West as the first game's was. The excitement around Red Dead Redemption 2 is revolving around the "realism" of its world: the length of its animal skinning animations, how you can pick up hats from the ground, and so on. For me, I just hope it's not afraid to chill out for a moment, to let sequences like an equivalent to "Compass" chiming in to play out. As for the original, it was the lengths of the American Frontier-set open-world that wowed fans; for me, it was one little music cue. Tagged with Feature,	music,	open-world,	Rockstar Games,	Take-Two Interactive Software.